A web site dedicated to haptic interfaces run by Dr. Tomohiro Amemiya. A Collection of multi-touch patents, Jun. 10, 2008 ~ Jun. 31, 2008. Tung Wan Cheng, “Flexible Muli-Touch Screen,” US20080180399, Jun. 31, 2008. 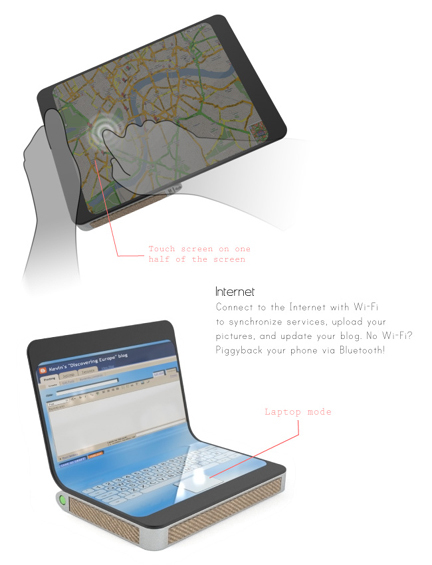 Abstract: A method, apparatus, and system of flexible multi-touch touch are provided. The invention comprising: a flexible layer; and one or more sensors configured to detect a plurality of simultaneous touching positions at distinct locations of the layer and to generate distinct signals representative of the locations for each of the touches. And a method for flexible touch panel comprising: driving one or more sensors; and detecting a plurality of simultaneous touching positions at distinct locations of a touch panel, wherein the touch panel comprising a flexible property. The invention is also directed towards a flexible multi-touch screen device, comprising: a display as user interface; and a multi-touch panel with flexible property to combine with the display configured to detect a plurality of simultaneous touching positions at distinct locations of the multi-touch panel. Jefferson Han, "Multi-touch sensing through frustrated total internal reflection," US20080179507, Jun. 31, 2008. Abstract: High-resolution, scalable multi-touch sensing display systems and processes based on frustrated total internal reflection employ an optical waveguide that receives light, such as infrared light, that undergoes total internal reflection and an imaging sensor that detects light that escapes the optical waveguide caused by frustration of the total internal reflection due to contact by a user. The optical waveguide may be fitted with a compliant surface overlay to greatly improve sensing performance, minimize the affect of contaminants on and damage to the contact surface, to generally extend system life and to provide other benefits. The systems and processes provide true multi-touch (multi-input) and high-spatial and temporal resolution capability due to the continuous imaging of the frustrated total internal reflection that escapes the entire optical waveguide. Among other features and benefits, the systems and processes are scalable to large installations and are well suited for use with rear-projection and other display devices. S. P. Hotelling (Apple), "Touch screen stack-ups," US20080165158, Jun. 10, 2008. Abstract: A multi-touch sensor panel is disclosed that can include a glass subassembly having a plurality of column traces of substantially transparent conductive material that can be formed on the back side, wherein the glass subassembly can also act as a cover that can be touched on the front side. Row traces of the same or different substantially transparent conductive material can then be located near the column traces, and a layer of dielectric material can be coupled between the column traces and the row traces. The row and column traces can be oriented to cross over each other at crossover locations separated by the dielectric material, and the crossover locations can form mutual capacitance sensors for detecting one or more touches on the front side of the glass subassembly. P. Jogueet and G. Largillier (Stantum), "CONTROLLER INVOLVING MANIPULATION OF VIRTUAL OBJECTS ON A MULTI-CONTACT TOUCH SCREEN," WO1719047, Jun. 23, 2008. Abstract: The invention relates to a man/machine interface which enables music softwareprograms to be controlled using a touch screen to manipulate virtual objects. More specifically, the invention relates to a method of controlling a pieceof computer equipment using a device comprising a multi-contact two-dimensionalsensor for the acquisition of tactile information and computing means whichgenerate control signals as a function of said tactile information. The inventionis characterised in that the method comprises a step involving the generationof graphical objects on a screen that is positioned under a transparent tactilesensor, each of said graphical objects being associated with at least one specificprocessing principle. According to the invention, during each acquisitionphase, the sensor delivers a plurality of tactile information, whereby eachpiece of tactile information undergoes specific processing determined by thelocation thereof in relation to the position of one of said graphical objects. S. P. Hotelling (Apple), "Touch screen stack-up processing," US20080165139, Jun. 10, 2008. Abstract: A multi-touch sensor panel is disclosed that can be produced by forming a plurality of first traces of substantially transparent conductive material on a first substrate, forming a plurality of second traces of the substantially transparent material, and creating a fluid-tight gap between the plurality of first traces and the plurality of second traces. The fluid-tight gap can then be filled with a fluid having substantially no bubbles and an optical index similar to the optical index of the first and second traces to make the gap and the first and second traces substantially transparent. The second and first traces can be oriented to cross over each other at crossover locations separated by the fluid, the crossover locations forming mutual capacitance sensors for detecting touches. C. H. Krah et al. (Apple), "Digital controller for a true multi-point touch surface useable in a computer system," US20080165134, Jun. 10, 2008. Abstract: An embodiment of an improved touch surface controller for controlling a multi-point touch surface such as a touch screen or a touch pad in a computer system is disclosed. 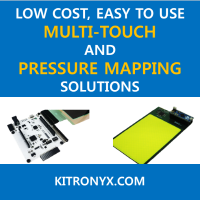 The improved touch system controller detects signal capacitance from the pixels in the touch surface digitally, and therefore is easier and simpler to implement then previous approaches relying on analog detection and processing. Specifically, signal capacitance is measured by measuring a number of clock cycles taken to discharge or charge the input node of a comparator. Embodiments of the disclosed touch surface controller are particularly useful in the context of detecting multiple simultaneous touches on the touch surface. J. G. A. Weiss et al. (Microsoft), "Recognizing multiple input point gestures," US20080165132, Jun. 10, 2008. Abstract: The present invention extends to methods, systems, and computer program products for recognizing multiple input point gestures. A recognition module receives an ordered set of points indicating that contacts have been detected in a specified order at multiple different locations on a multi-touch input surface. The recognition module determines the position of subsequently detected locations (e.g., third detected location) relative to (e.g., to the left of right of) line segments connecting previously detected locations (e.g., connecting first and second detected locations). The gesture module also detects whether line segments connecting subsequently detected locations (e.g., connecting third and fourth detected locations) intersect line segments connecting previously detected locations (e.g., connecting first and second detected locations). The gesture module recognizes an input gesture based on the relative positions and whether or not line segments intersect. The gesture module then identifies a corresponding input operation (e.g., cut, paste, etc.) to be performed. One Laptop per Child (OLPC) offers several photos of a dual-touchscreen laptop XO-2 concept from its Wiki document. UniPixel announced that it has developed a novel thin film that prevents fingerprints from obscuring a display. The schem is also called anti-smudge and required to increase the usabiliyt of touchscreens. Unlike UniPixel, SMK offers an anti-smudge touch panel. RRFC touch starts by generating an AC voltage which is applied to two adjacent corners and a DC voltage which is applied to the opposite two corners forming a voltage ramp across the sensor and a corresponding ramped electro-static field. The controller repeats this for all four possible corner combinations.. The measurement of the energy in the fields happens at each corner in a way that efficiently removes all capacitance effects except those that are related to a finger touch. In its simplest form, the actual touch point on the X or Y axis is a ratio of the measured results from the two ramped fields that were generated on that axis. Not so surprisngly, they seems to plan to be a solution provider of dual-mode pen and touch technolgoy. At this time, N-trig and InPlay technologies are major providers of dual-mode pen and touch technolcoy. For Tablet PC OEMs designing dual-input applications, Wacom RRFC touch technology can be easily integrated with Wacom's market-leading EMR pen-input technology. As high density living puts a strain on private space, storage space tends to suffer the most. One of the items people find hard to let go of are books. To those who own a lot of books, books are much more than what meets the eye. Collections of books tend to be ones’ pride and memory on certain moments in life. When taking a dusty book of the shelf one may remember the state of mind on the first read years ago... LIVRE is a new age book, a product that addresses all of these aspects of book reading! Although there are so many multi-touch systems around the world, no one really has offered SDK for users to develop their own multi-touch applications. However, Stantum introduces the fist commercially available and out-of-the-box SDK enabling you to build your own multi-touch user interfaces. Although it seems to be a perfect platform to develop multi-touch user interfaces, you should know that its price is almost $5,000. Asus, now famous for its ultra mobile Eee PC series, adds two new input devices to its product line. The first one is Eee stick. As you can guess from the figure below, it provides users with Nintendo Wiimote gaming experiences. The second one is a multi-touch touch pad. I got this concept phone design from Engadget with the title of "Folding Plica concept phone makes our eyes widen". Actually, my eyes were not so widen since there have been many concepts and prototypes that claim foldable or flexible displays. However, the important point is that marketability of adopting such displays are now virtually proven. The next important step is who makes the first landmark product such as Apple's iPhone.